What do the letters DT mean after the L1501? Well in this case it is written right alongside - Double Traction - which is Kubota's way of saying this is a 4WD tractor. Ever wonder what those letters mean at the end of most Kubota model designations? For example, what is the difference between a L175F and a L175DT? What type of agricultural setting might you find a M8540DTNHC in use? Lettering to identify variants within each line is littered everywhere – Kubota’s brochures, service, parts and operators manuals, online discussions, reviews, auctions, advertisements and so on. Knowing how Kubota identifies variants within a model range is very helpful when it comes time to make buying decisions or afterward, when performing regular service and maintenance. 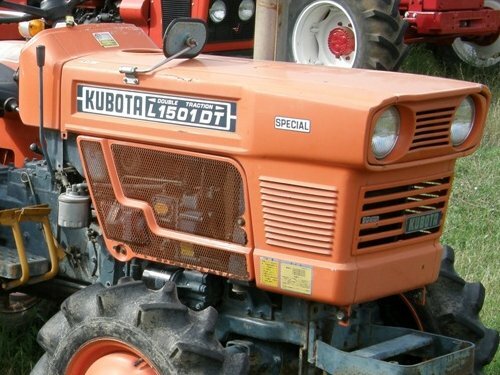 It is very common to find the variant lettering appended to the main model number right on the hood for older Kubota equipment (1970s-1990s). In recent years Kubota has really toned down how many letters they physically apply to the hood although reference literature and brochures still make use of lettering. So our M8540DTNHC from above would be a M Series 8540 four wheel drive, narrow and high clearance tractor. We would likely find this in use on a vineyard (a very big one for that kind of horsepower). What follows are more detailed lists for various model designations that Kubota has usedin the past and currently offers on their new models. This is not a complete list but is a very good start. Jump to a section or scroll down.